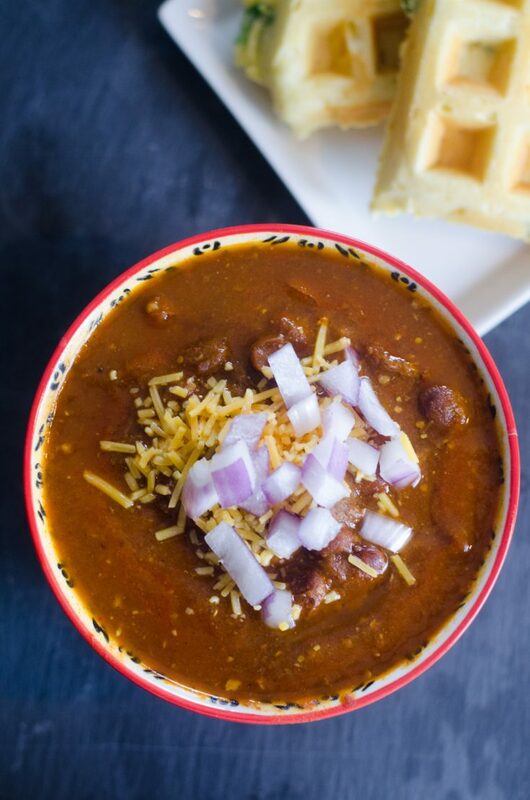 This Instant Pot Stew Beef Chili with Cornbread Waffles is just the perfect meal for a lazy chilly Sunday! Even better if that lazy Sunday involves watching lots of football. It is the perfect quick delicious hearty warm your tummy meal. 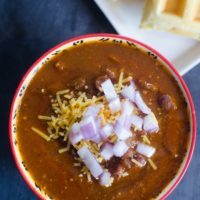 Serve it chili bar style with all your condiments lined up for people to create their own chili masterpiece. The cornbread waffles of course being my favorite side to this delicious dish. If you love this instant pot recipe you need to check out my other recipes on the blog. CLICK HERE to see more recipes. Set instant pot/ pressure cooker to saute mode. Add the beef and onions. Saute until browned. Add in beef broth, mustard, and spices. Stir well and set the pressure cooker to 20 minutes on high pressure. Let pressure release naturally. Set to saute mode. Pour in tomato sauce and chili beans. Stir well. Cook for about 10 minutes stirring often. Mix cornbread and two eggs. Slowly add in milk until you get a batter that is not thick but not to thin. The consistency needs to be thick enough not to run but thin enough to cook. Add in onions and cheese. Cook for 5 to 7 minutes until waffle is lightly brown on the outside. Serve topped with diced red onion and sharp cheddar cheese. I made this last weekend for the football game it was soo good!